It is disturbing when a crime reporter gets crime reporting wrong, as did Rochelle Jackson on ABC Radio’s Nightlife with Suzanna Hill on June 28, 2018, talking about one of the most important and controversial legal cases currently before the courts: the Sue Neil-Fraser case. In flagrant disregard of the facts, Jackson misled listeners on a number of issues. Sue Neill-Fraser was convicted of murder in 2010, after her partner of 18 years, Bob Chappell, disappeared from their jointly owned yacht, Four Winds, anchored off Sandy Bay in Hobart on Australia Day 2009. In the afternoon, Neill-Fraser had taken the dinghy ashore, Chappell stayed on board doing maintenance work. At dawn the next morning the yacht was reported sinking slowly, with no sign of Chappell. What appeared to be a clumsy attempt at sabotage had caused the Four Winds to take on water. It was a mystery. The police soon tagged Neil-Fraser (now 64 not 62 as Jackson said) as the sole suspect. She was arrested and charged with murder on August 20, 2009 – and was denied bail. that blood specks in the yacht’s cabin ‘implied a blunt weapon’ had been used. Not to first respondent police, who did not even suspect foul play when Bob Chappell was missing from the yacht, after boarding the yacht and examining the cabin. It was later revealed that the blood spatter could have been caused by Chappell’s chronic nose bleeds. Five carpet tiles (speculated to have been disposed of to hide blood stains) and a fire extinguisher were missing (speculated to have been used to weigh down the body) but there was no evidence to suggest the fire extinguisher had been on board. Missing carpet tiles were not tested for blood stains … as they were missing. The luminol test performed on the dinghy to test for various substances was never followed up with a confirmatory test for blood, and the DPP himself told the trial judge (jury absent) he never believed there was blood in the dinghy. He had speculated that Neill-Fraser had killed Chappell below decks, winched the body to the deck and dumped it into the dinghy before disposing of it in the Derwent somewhere. This scenario was not supported by any evidence. Jackson said “the police had security footage of a car identical to hers passing a local bank after midnight, which of course was when she claimed she was in bed.” This was clearly meant to suggest that it was Neill-Fraser’s car. Why else refer to it? The security footage was never shown to the jury. In the footage, according to Jennie Herrera, President of the Sue Neill-Fraser Support Group who has seen it, the number plate is not visible; the driver is not visible; the car’s make and model is difficult to identify. “it requires a leap of faith to determine that the vehicle was a Ford Falcon of which there are hundreds, probably thousands, in Hobart,” says Herrera. The Nightlife report was broadcast at 11.30 pm on Thursday, June 28, yet Jackson told listeners that the next hearing in the case was set for some time “later this month.” It is in fact scheduled for August 20, 2018, the 9th anniversary of her arrest. Do we really need to wait as long as we did with Lindy Chamberlin to acknowledge this woman’s innocence. A mother and Grandmother who is being denied the human right to a FAIR trial without the comedy of errors and mismanagement of her case by Police and the Justice System. The bigger question is for me ‘what’s being covered up here’ and who is really being protected? How many powerful figures who are corrupt and part of the system are going to make sure SNF continues to be the scapegoat of this heinous crime? This is not a case where clearly there was evidence that proved anything beyond all reasonable doubt. So many holes too many unanswered questions. Here’s the thing though, it doesn’t matter what we think. The system won’t change unless it is forced to by the people. Unless something radical is done every family in Tasmania is at risk of being wrongfully incarcerated by its incompetent Police force and the system will do nothing to protect them. It’s quite scary to read what’s happened to this poor woman and her family. A double loss for all the children involved. Now my memory also is that she was asked by Counsel (it was probably Mr Gunson) about whether she carried out confirmatory testing on a number of specific locations on the dinghy. Each of these had an identifying number (or caption … can’t think of a good name for it … and can’t be bothered looking up the transcript to find an example) and Debra McHoul, questioned about them, in each case, told the court that she had not carried out any confirmatory test on them. Forgive me if I word this poorly. In that XXN, I don’t recall her being asked in general about whether she performed confirmatory tests ib the dinghy, that is, about whether she had carried out any at all on the dinghy. Over the years, as I’ve reread and worked on the transcript, I always had the impression that she had not carried out any confirmatory tests at all. Yet during the Mar2018 appeal application hearings, I heard evidence that was quite surprising. Dr Mark Reynolds appeared as an expert witness to give evidence on his three reports on blood stain pattern and trace blood analysis as well as the the state of the winch and ropes on the yacht. He was challenged, as I recall, about his expertness with ropes/winches), though not on the matters of blood. He told that court that he based his reports on the Tas Forensic Services Reports, portions of the court transcript, forensic crime scene notes and case notes on the examination of the dinghy. Dr Reynolds had learnt of these 16 negative confirmatory tests through the case notes. He did not learn of them through the forensic biology reports, just as you and I, Andrew, did not learn of them through Debra McHoul’s evidence as it appears in the Court Transcript. Having perhaps sown the ‘it was blood’ seed he then was able mention that another screening test had been negative. I’m unaware of a second screening test being used, though I’m now aware of the Ouchterlony confirmatory test being used and being negative. The luminol result in the dinghy was a big red herring, in my opinion. Through all of this no-one has addressed the issue of how a woman on her own could tip a body out of a dingy without tipping it over! Try it and see, its actually near impossible. 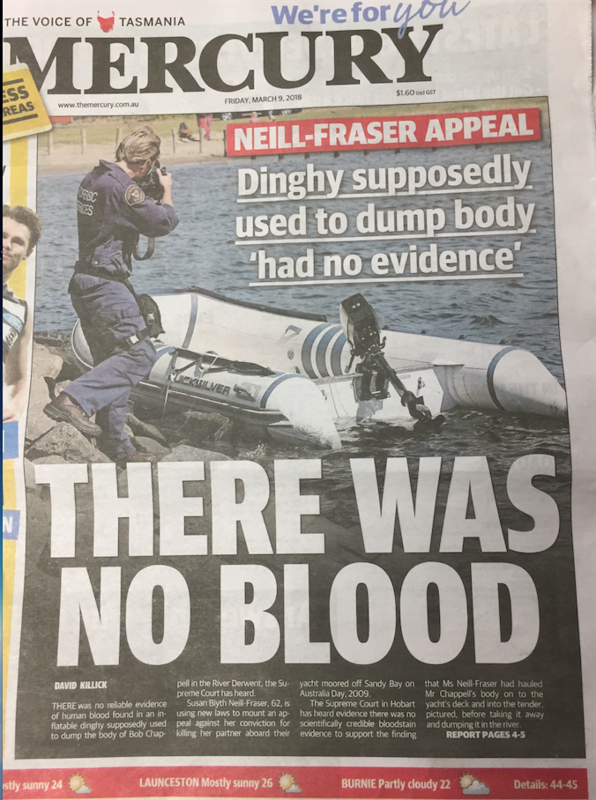 Given that there is no material evidence inside the dingy, seems like a rather large hole in the case, on a practical level to me. Greatest miscarriage of justice since the Lindy Chamberlain case. Shame on Australia. If reporters who didn’t check their facts or flagrantly reported inaccuracies were charged with negligence and/or gross unprofessionalism and miscarriages of justice, would they try a bit harder? If they or a family member ever had to go through something like SNF or her family have, they would know the damage and hurt that can be caused by those who should know better continually espousing/reiterating/facilitating untruths/lies in the hope of 5 minutes of fame – Shame! Shame! Shame! They are now accessories to the deception. Jail time for them? How awful! Suzanna Hill – are you REALLY interested in the truth? Gossip sessions are for over the back fence (and may they cease as enough people are hurt even there!) – your show is meant to be for … what? Hopefully someone who has undertaken comprehensive research of the Susan Neill Fraser case will be invited to give a factual report on “Nightlife” to accurately portray the seriousness of this recognised Miscarriage of Justice in Tasmania. (Dr Robert Moles, Robert Richter QC, Tom Percy QC, Chester Porter QC, Stuart Tipple to name a few eminent legal practitioners have publicly expressed their concerns). Why is nothing happening in Tasmania to review this case in a timely and transparent fashion? This inaction and the ongoing delays are profoundly disturbing and should not be occurring in Australia! Time for an urgent independent inquiry or commission into the handling of this case and its review? The Sue Neill-Fraser case is the most gross miscarriage of justice since Lindy Chamberlain. I am shocked that a reporter could get it so wrong, and all the wrongs are against Sue Neill-Fraser. Totally unprofessional.